It's actually the perfect logo... for a construction company (stop sign) that builds gyms (barbell)! Most of the Americanized names in MLS are just fine: Sounders, Whitecaps, Timbers, Earthquakes, Crew, Impact... "Americanized" names that wouldn't look out of place (from the lower divisions): Sacramento Republic Indy Eleven Charlotte Independence Las Vegas Lights Phoenix Rising New York Cosmos Jacksonville Armada Charleston Battery Bethlehem Steel Tulsa Roughnecks Oakland Roots etc. etc. Just because Nashville Beat, Groove, Honky Tonkers, Vibe, and Notes would all be f'ing terrible names, doesn't mean it's not possible to have decent Americanized names. Have any of these people ever seen a tiger before? Nashville MLS rebrand coming Feb 20th? Here's what they're currently using in USL: I think only minor changes are needed... The year being straight text in a curved circle looks awkward. I'd go with Nashville around the top, Soccer Club around the bottom, no year. Aside from that, the white circle is a bit too large relative to the inside circle. Their primary kit better have a "six string sash" across the chest, that is just too obvious... although with those colors and a sash they're going to look like the LA Galaxy. If Atlanta United are nicknamed the Five Stripes, does that make Nashville the Six Strings? 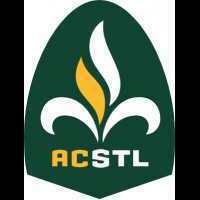 Bring back AC St Louis! Colors and badge The inverted shield features a fleur-de-lis with a golden flame beneath a catenary arch. The fleur-de-lis, a long time symbol of the city featured heavily in the region's iconography, was a symbol of French monarchs including Louis IX of France, for whom the city is named. The flame alludes to the 1904 Summer Olympics which were held in St. Louis as part of the St. Louis World's Fair, and is seen by many St. Louisans to be one of the formative events in the city's history. The arch represents the Gateway Arch, which was built in 1965 as a memorial to the city's placement in American history as the "Gateway to the West." 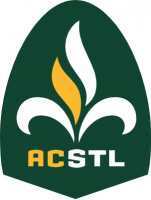 A.C. is an homage to the Missouri Athletic Club, which has promoted soccer in the region for more than 100 years. It would fit right in with the other greens! If you're going to include Inter Miami, it might be time to also add Austin FC. The MLS site just added Austin's crest at the top: Still waiting on Nashville... do we know when they're expected to reveal their new crest?